The Complete Idiot’s Guide to Playing the Ukulele features our own Nick Torres, providing vocals for many of the song examples. Nick also was kind enough to contribute an original song of his own, for the chapter on how to play ukulele in a traditional band setting. And if that’s not enough, you’ll also get an incredible fingerstyle arrangement of “Over the Rainbow” for ukulele and voice. 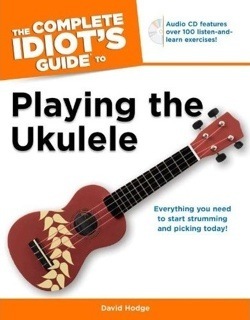 Order The Complete Idiot’s Guide to Playing the Ukulele from Amazon.com today. While other books get caught up in the novelty of the ukulele-how to accessorize them, who the best ukulele players are, etc…, this book covers in crystal clear detail everything beginners need to know to enjoy playing this tiny, four-stringed instrument. From strumming and finger picking to playing different genres and playing as part of a group, this book covers all the bases. And it includes a rich audio CD complete with music samples and ukulele exercises. Before rushing out to buy a your first uke, invest in this guide first and read the excellent tips in Chapter 21. Then then you’re ready to start enjoying a musical hobby that will fill solitary hours as well as impress your friends! Get an idea what this book is like by checking out David’s free ukulele lessons here on Guitar Noise.